For many years the speedy blue hedgehog Sonic has been a favourite in our house. We have plastic and plush toys, and console games and my youngest regularly races to school with his arms held backwards for his awesome Sonic impression. It gets him to school fast so it's fine with me! And from October 24 (2016) we can enjoy Sonic on DVD and digital download in a comedy adventure series SONIC BOOM that follows him battling a familiar foe. This new set of episodes (Volume 4: No Robots Allowed) sees some unexpected love advice from a surprising source, a head-to-head robot battle and the unexpected and shocking return of a familiar face that even has Dr. Eggman quivering in his boots. Supported by his trusty sidekick, Tails, plus pals Knuckles, Amy and Sticks, the gang is seen trying to ward off the evil plans of Dr. Eggman, who is determined to take over the world. Packed full of high-adrenaline action every episode starts from a small character-driven story and explodes into an epic tale of adventure as Sonic battles robots to save the world. Can Sonic and his squad save the day and stop Dr. Eggman's evil plans? Well you will just have to watch to find out. We got a sneak preview and thoroughly enjoyed the cartoons. There's lots of humour and plenty of speedy Sonic action. The DVD/download is rated U so you can be assured it's all harmless family fun. 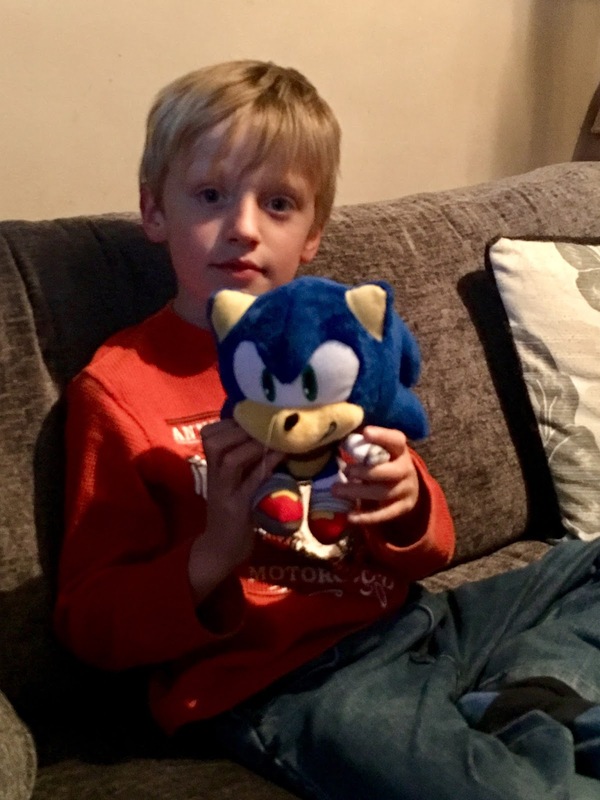 Grumpy (aged 8) was already a huge fan but now loves nothing better than curling up with his tablet to enjoy an episode or two whilst cuddling his plush Sonic toy of course!